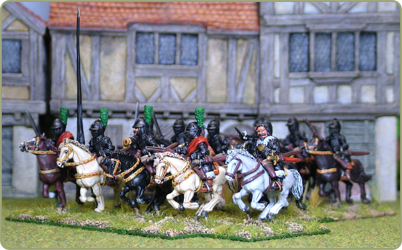 Over the last few months, we've working on expanding our existing range of 28mm figures for the Thirty Years War. Foot packs are £8 for eight figures. Mounted packs are £9 for four figures. Other packs as listed. Buildings shown in the background are from the new range produced by Total Battle Miniatures. TYW02 Musketeers, ragged uniform firing. winter dress in hongreline and fur hat. TYW06 Gustavus Adolphus and senior officer£6. TYW07 Pike man, morion with long coat. At port. TYW10 Foot command.I (4 figures). TYW11 Foot command II (4 figures).